The complexity of Janet Laurence's sculptural installations, both semiotically and perceptually, is dizzying. Her oeuvre poses repeatedly the question of how the diverse elements of nature might find their way into our all-too-often, only-too-human capacities and habits of knowing and perceiving. This has been particularly true of a recent series of works that has included Waiting: A Medicinal Garden for Ailing Plants and After Eden. So too with her Memory of Nature, which I visited several times at the New South Wales Art Museum during early August of 2012. A strong elegaic quality permeates Memory which has led curators to characterize it as "a memorial to nature now lost." But the presence of nature, even aspects of nature that are profoundly in danger of being wiped off the face of the earth, is actually more to the point in Laurence's approach to her subject. Her works are inhabited by a loving tenderness for the living world, which, we are called to acknowledge, inevitably is also the dying world, indeed, the world become dead. Memory reminds its viewer how the distance between the unborn in the womb and the recently living being rendered back into earthly elements is not so far. Laurence would have human-beings enter into the liminal space between death and life, not in order to renounce earthly existence and all its chthonic mysteries, but in order to become fully acquainted with it and them. One dimension of Memory has to do with the arts of collecting, caring for and preserving specimens. 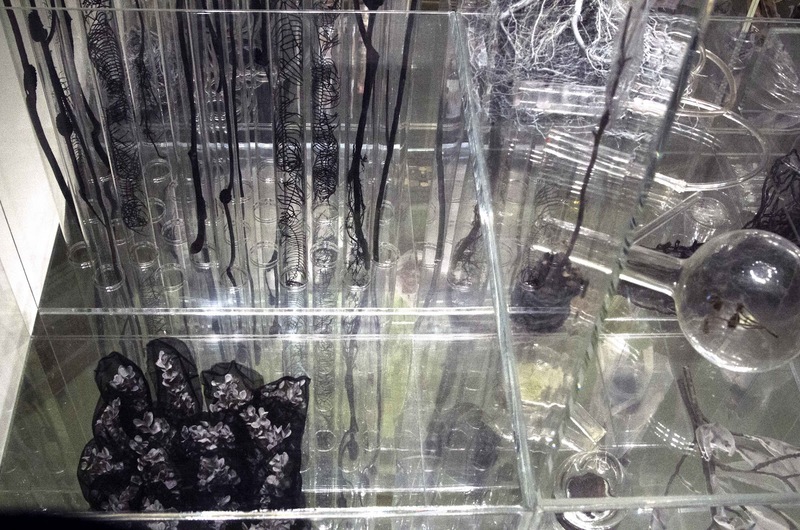 Memory itself is a multiplex specimen box, crammed with specimen jars of various shapes and sizes, some of which are empty and many of which are filled with objects: thistle seeds, burnt bones, dried branches, mounted insects, mounds of sulfur, whatever. Memory reminds us, gives us again a mind to understand, that a specimen bottle need not remain a cold and abstract tool but might also become a mode of engaging in a relationship with the once living. The specimen bottle, she reminds us forcefully, is also a tomb. And so Memory is both specimen box and hallowed resting place, indeed a specimen box of specimen bottles, a graveyard of tombs. One senses that for Laurence, this artwork, as well as the museum in which it finds itself, is as much a mortuary as anything. One is reminded that the development of the art gallery was intertwined early on with that of the natural history collection. Her works reenact the Wunderkammern, the cabinets of curiosity of Renaissance nobles, for whom the collecting of odd things, of the finest and the strangest, expressed a passion to interrogate and be interrogated by the natural world. But Memory also transforms the paraphernalia of preservation into light and so into image. As one looks into the manifold of glass boxes housing the various objects collected for viewing, one finds these at first seemingly inert specimens are also being transformed into a bewildering maze of reflection and counter-reflection, all of this intensified by the placement of mirrors on the bottom layer of the installation. Memory is an image machine. Entering into it, one's gaze is directed downward into a well of reflection, as each object and then each layer of objects is transposed into a virtual space possessing indefinite depths and fostering unexpected juxtapositions. After a time, one also experiences how one's fellow humans are inevitably brought into this play of light as the various gallery goers circulating around the piece are also reflected into it. It is as if one is looking into a Leibnizian monad, a unique particle that simultaneously carries all aspects of the world outside it also within its bounds. One is reminded as well of Laurence's favorite philosopher--Maurice Merleau-Ponty--who argues that very nature of the living body is already to be interwoven, interlaced, with every body surrounding it. In the act of perception, all living bodies, human or otherwise, find they are outside of themselves in order to be within themselves. As a result, the notion of the envelope body, of an inert mass contained within and by an explicit surface, turns out to be an abstraction, a mere residue, of the lived and perceiving body that is the envelope body's progenitor. Exploring the relationship of envelope body to lived body, Laurence's Memory asks its viewer to consider anew the very manner in which she or he is a body. One corollary to Merleau-Ponty's notion of a lived and perceiving body is that the body that is gazed upon is also a body that gazes back. One finds this insight at work in Memory. As one's gaze wanders into this maze of reflection, one registers that the work also has its own gaze and, indeed, is gazing back. This occurs in part through the placement within Memory of a series of owls (which will get their own blog later) preserved by the arcane arts of taxidermy and purchased by Laurence at an auction. Their gaze--or is it merely a simulacrum of a gaze?--confronts the gaze of the viewer, returns it. Indeed, the owl's gaze not only confronts the gaze of the viewer passing by but also that very confrontation of gaze with gaze confronts my gaze. I look upon the other (a viewer) looking upon another (the owl) who is in turn returning the viewer's look with one of its own. Memory reminds me my gaze is already an interweaving with the gazes of others--both within and without the artwork. I am also asked to consider how the gaze of a preserved owl has an ontological status quite different from that of a painted owl. Indeed, the sculpture has been arranged so that the largest owl looks out onto a nineteenth century landscape painting, one in which a hillside has been denuded of trees. The juxtaposition of the bodily remains of an owl, a creature who once actually flew through the forest night in search of prey, with the painted image of a forest provokes one among many passages of what I term semiotic destabilization in Memory. 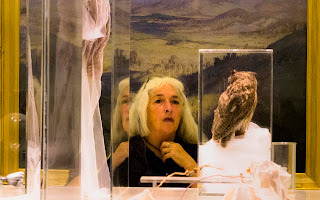 Anthropologist and cultural critic Deborah Bird Rose (who is pictured gaze to gaze with the owl above) visited Memory with me one afternoon. She remarked on how it, as well as other installations by Laurence, inspires a quiet and prayerful attitude in its viewers. And, sure enough, each gallery goer, as they entered into the room where Memory was located, would alter her or his demeanor. Conversations stopped as viewers would draw near in contemplation. I thought of how the overall shape of Memory was reminiscent of an altar. But Deborah's point was not that the sculpture made a reference to being an altar but actually was one, and that human viewers could sense this. The altar that was also Memory communicated reverence and remembrance in regard to both the fragility and the fecundity, the timidity and the ferocity, of the earthly. I am thankful for that. Very interesting exhibition, thought provoking and surreal in a natural way. The natural, when one looks closely, is more surreal than the surreal. Perhaps this is why dreaming is what it is? Member of the Extinction Studies Working Group. Member of Kangaloon, a group of eco-humanists engaged in literary and artistic activism. Professor in the Department of Environmental Studies at Salisbury University. Collaborates with SU students to maintain environmentally aware gardens on campus.